After years of growth, the supermarket chain, Albert Heijn lost 0,6 percent of the Dutch market share in 2018. The discount chain stores absorbed this share of the market. Lidl's share increased the most, with 0,4%. Aldi gained 0,1 percent. Jumbo and Coop's market share also grew. This was thanks to the takeover of the Emté stores. These figures were released by the research agency, Nielsen. Every year, Albert Heijn has managed to increase its market share. However, in 2018, this dropped to below the 2015 level. 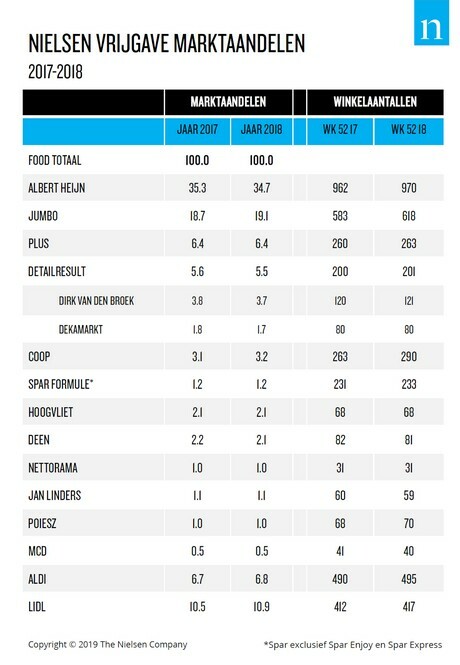 In contrast, Lidl grew significantly from 10,5 to 10,9%. Another discounter, Aldi, also increased its share. This, after several years of decline. There was also growth for the supermarket chains that acquired the Emté supermarkets. This ensured that Jumbo's market share climbed from 18,7 to 19,1%. Coop benefited to a lesser extent. They noted a 0,1 percentage point increase - from 3,1 to 3,2 percent. The Superunie members' market share remained the same. These are Hoogvliet, Nettorama, Jan Linders, and Poiesz. Deen and both branches of Detailresult yielded 0,1 percent of their market share, compared to 2017.